We do eat things other than butter and sugar and heavy cream around here. But, we don't eat much salad. My hubby doesn't like it. So, every time I buy lettuce with aspirations of converting my non-salad-eating hubby into a salad-eater, it turns brown and gooey before I even think to make something with it. There are, however, two salads that he will eat. Anytime. A good Grilled Chicken Caesar. And, this one - Cran-Raisin Walnut Salad with Cranberry Vinaigrette. This salad has the most deliciously sweet and tart dressing, served over red leaf lettuce and baby spinach, and topped with feta cheese, cran-raisins, and toasted walnuts. It's got that salty/sweet thing goin' on. Kinda like a peanut butter cup. Only it's a salad. It makes us feel all healthy like. So, we have peanut butter cups for dessert. This salad has a homemade dressing. Girls, if you only buy bottled dressing (like I did for years and years), and you've never made a homemade salad dressing, you can make this one. If you have a blender or food processor, it's as easy as making a smoothie. And, the payoff in flavor is huge. All of the "toppings" are optional. If you don't like nuts, skip 'em. Don't like feta (poor, pitiful souls)? You can leave it off, or substitute another type of cheese. Not only is this salad sure to win over the pickiest of non-salad-eaters, but it makes for a beautiful presentation. And, it's killer served alongside Chicken Tetrazzini. Combine red leaf lettuce, baby spinach, and sliced red onions in a large bowl. Set aside. In a food processor or blender, combine cranberry sauce, red wine vinegar, one tablespoon red onion, and honey in food processor. Pulse until combined. Gradually add oil, processing until smooth. Pour salad dressing over greens, and toss to combine. Place one cup of salad mixture on a salad plate. Sprinkle with feta cheese, followed by walnuts and cran-raisins. 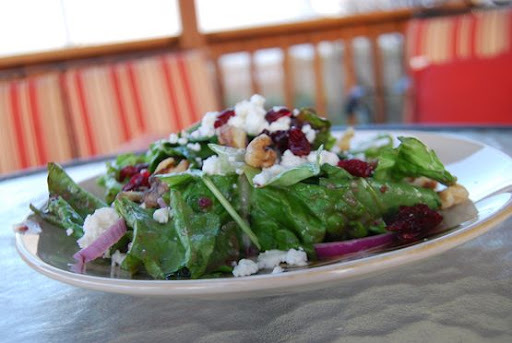 *This salad is even better with fresh cranberries, when available. Just substitute 1/4 cup fresh cranberries for the cranberry sauce, and add 1 tablespoon sugar to the dressing. *If serving to a group that might not like all the toppings, I often create a "salad bar" of sorts. I put out a large bowl of the salad mixture on the table, and a cluster of little bowls on the side containing feta, cran-raisins, and walnuts. And, I'll serve the dressing on the side in a gravy boat. This allows everyone to create individual salads to their liking. I love that salad idea. I make something similar to that. Most of the time when we have salad, I look in the pantry and see what I can do about toppings and then create. This is definitely going in my recipe box. Yumm!! PS. We've been drinking gallons of sweet tea ever since you posted your "recipe." Mmmm! It is one of the best salads. I need to make that again! Homemade salad dressings are very easy to make. I used to think it was complicated, but it's a matter of good ingredients and a shake or two. I am with Jason. Not much of a salad eater... truth be told, not much of a veggie eater. But I do like ceasar and also any kind of vinegrette, fruity with fetta and walnut...I often make ours with raspberries or blackberries. Will have to try making the salad dressing. Thanks! You had me at feta! YUM! I make a very similar recipe minus the cranberries - will be trying this one out too!! Yippee!! I've never cooked with cran-raisins before but I'm guessing if you put them in, they taste great. The salad looks awesome.